Denison City Hall is located at 500 West Chestnut Street, Denison, TX 75021; phone: 903-465-2720. Photo: Main Street, Downtown Denison, TX. Photographed by User:Kennethmyers (own work), 2009, [cc0-by-1.0 (creativecommons.org/publicdomain/zero/1.0/deed.en], via Wikimedia Commons, accessed July, 2013. As evidenced by the City's original central business district, Denison boasts a rich history dating back to the early 1870s. Denison's original settlement was established in 1872 as a joint venture between private investors and the Missouri, Kansas and Texas Railroad (MKT or Katy Railroad). Denison was originally established as a railroad hub that served as the point of entry into Texas for the first track that was extended across the Indian Territory. The founders decided to establish Denison after the City of Sherman decided not to help fund the construction of a new rail station. Denison was named for Katy Vice President George Denison. In its early years, Denison grew at an extremely rapid pace. The original town was first established as a tent city. However, the first three blocks were completely developed on both sides with masonry structures within 10 years. By 1920, blocks 100 through 600 were completely developed. Denison's vibrancy was evidenced by the establishment of a number of important institutions and businesses from the late 1870s to the early 1900s. On February 6, 1873, Denison established its first public school, which is claimed to have been the first free public school in the State of Texas. In 1884 the City had an opera house that reportedly seated 1,200 and by 1886 the City had opened its first post office. As mentioned, the Katy Railroad originally established the City and, not surprisingly, it quickly developed as one of the major retail and shipping centers for North Texas. By 1900, Denison became a stop on the Saint Louis, San Francisco and Texas, and the Kansas, Oklahoma and Gulf Railroads. The MKT Railroad Passenger Station, which still stands at the east end of downtown, was built in 1909 at a substantial cost of $250,000. The station received 52 arriving and departing passenger trains every 24 hours at its peak. 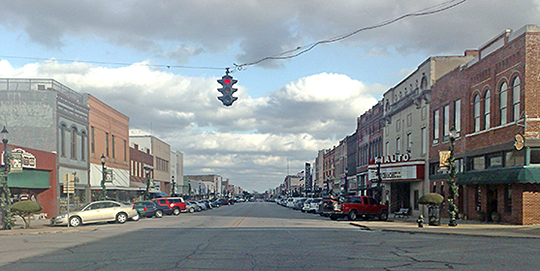 As a major transportation hub, the City of Denison was ideal for many types of manufacturers and retailers. An impressive industrial and manufacturing base evolved during the early part of the twentieth century. Firms that produced goods including electronic parts, clothes, furniture, and plastic products were built during this time period. One of the most significant commercial operations, which was established in 1885 by Mr. Pat Tobin, was the Southern-Crystal Ice Company. This was one of the first ice plants in North Texas and is credited with being one of the first ice factories to pioneer the cross-country shipment of beef in refrigerated railroad cars. Denison suffered its first major economic downturn in the early 1920s. The community's dependence on the railroad industry made it extremely susceptible to the nationwide railroad strike that lasted from 1922 to 1923. From 1920 to 1930 the population dropped from 17,000 to 13,800. Also during this time period, the MKT Railroad moved many of its operations to Waco. This relocation resulted in the loss of many jobs and families. As a direct result, many of the retail and commercial establishments located in downtown were forced to close and many homes were left empty. City of Denison, Texas, Comprehensive Plan 2002, www.cityofdenison.com, accessed October, 2014.